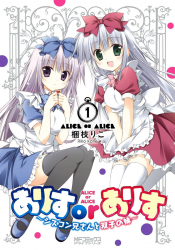 Synopsis: This story is about the cozy, daily life of the Alice twins and their siscon brother. They eat, fight, and play together with their friends... Would you like to peek into the heart-warming life of the adorable Alice and co.? Chapter 30: After-class group with everyone! Chapter 24: Everyone's Theme Song!? Chapter 17: Going to a hot spring with everyone!? Chapter 14: It's lively both during Christmas and New Year! Chapter 10: Kisaki, The Real Little Sister? Chapter 9: A Rainy Day!? Chapter 7: Alpaca's Big Makeover!? Chapter 6: Today is Hinamatsuri! Chapter 5: The Great Valentine's Offensive…!? Chapter 4: Airi has a fever!? Chapter 3: Christmas with Everyone! Chapter 2: At the Beach with Everyone!